Azul Fine Jewelry specializes in designer bridal and fine jewelry all hand made in America, meticulously crafted for ultimate comfort and wearability. Azul designs encompass classic and timeless elegance at an extraordinary value. The Azul bridal collection is available in an assortment of metals and diamond qualities, all beautiful and expertly matched to help meet a range of budgets. Azul also offers a custom design division utilizing master craftsmen, so if you can dream it, they can create it. Paul Weisbroatand Michael Green launched Azul in 2005 with combined 70 years of experience in working with the finest brands and designers in the jewelry industry. 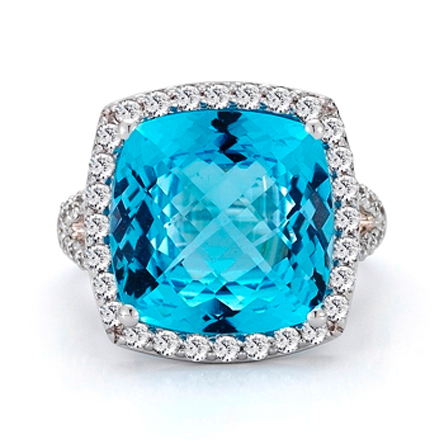 Based on their love for rare Indicolite Tourmalines, they were inspired to name their company Azul Fine Jewelry, reflecting Paul’s passion and knowledge of colored gemstones and Michael’s eye and flair for design. Today, the Azul collection continues to grow and is available at exclusive retailers nationwide. Michael Greendraws his knowledge of manufacturing, design and production from over 40 years of experience in the jewelry industry. His expertise and understanding of the business allowed him to build several successful diamond lines from the ground up. Michael has been honored with several awards, including Intergold’s Designer of The Year (currently Gold Council) and has had the privilege of working closely with world renowned diamond cutter Gabi Tolkowski, designing mountings to accentuate the beauty of Gabi’s skillful diamond work. Michael continues to travel from coast to coast meeting with retailers to comprehend their needs and cement long lasting relationships. With over 30 years of experience in the jewelry industry, Paul Weisbroat is extremely versed in international sourcing and possesses great knowledge of socially and environmentally responsible manufacturing and production. In addition, Paul is a G.I.A. Graduate Gemologist (GG) and Certified Gemologist (CG) with the American Gem Society and an Assistant Professor of Gemology with the Jewelry Design Department at The Fashion Institute of Technology, State University of New York. His expertise and passion for gemstones is unrivaled and has enhanced his involvement and work with companies such as Tiffany & Co., David Yurman and Robert Lee Morris. Paul, a true adventurer, has journeyed to all ends of the world to obtain the rarest and most beautiful diamonds and colored gemstones.